Over spring break, several students from the music technology program made a trip to Belfast, Ireland, to visit Queen’s University, a possible candidate for an exchange program for music technology students. Music professor Neal Schmitt and a group of 13 students visited Queen’s University to preview their audio engineering program and meet the professors. The main purpose of the trip was for professor Schmitt to learn more about the opportunity to do an exchange, as well as allow the students to explore Belfast. 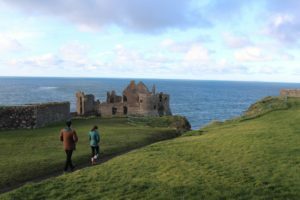 One music technology student who went, Jenna Jaworski, said that there were many parts of the trip that were a lot of fun, including a tour of the coast of Ireland and visiting the city of Dublin. For many of the students on the trip, this was their first time to Ireland, and for others it was their first time out of the United States. Plenty of the students said they learned a lot from the trip, but Heim said that the trip helped him realize how big the world is. those students, senior history major Nathan Samms, went on the trip to learn more about Ireland and Belfast’s history for a research paper. Also, it’s always been a lifelong dream of his to visit Ireland. This trip, for Samms, was about learning about the Irish culture and immersing himself in the daily lifestyle of the locals. Instead of spending time at the university, Samms visited several pubs and bars in the area. During this time, he had the opportunity to meet and speak with locals, giving him a lot of insight into the culture. One of the people he met was an older man who grew up through The Troubles, a time of civil conflict occurring in Northern Ireland from the late 60s to the late 90s. Samms learned a lot more about the time period from a personal side and is able to use a lot of this information for his research paper. Angela Grate, a senior economics, political science and English triple major also went on the trip. Her experience was also quite different from that of the music students because she attended law classes at Queen’s University. She said she learned a lot about the law program there, but was also really glad she got to learn about Irish culture. “I enjoyed seeing the differences and the trust that people in Belfast have in one another and their society,” Grate said. She also said seeing the differences between the United States and Belfast’s culture was interesting. 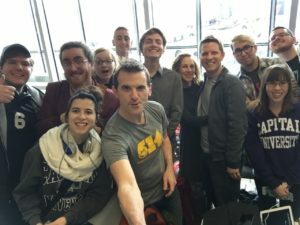 While the trip was the first of its kind, the Professor Schmitt hopes that this is the first step to an exchange program with Queen’s University.